The carbon cycle is the cycle by which the element carbon moves through our Earth’s various systems. It is a fascinating and complex process because living things, atmospheric changes, ocean chemistry, and geologic activity are all part of this cycle. Carbon is an essential element for life as we know it because of its ability to form multiple, stable bonds with other molecules. This is why nucleotides, amino acids, sugars, and lipids all depend on carbon backbones: carbon provides a stable structure that allows the chemistry of life to happen. Without carbon, none of these molecules could exist and function in the ways that permit the chemistry of life to occur. To become part of the carbon cycle, carbon atoms start out in a gaseous form. Carbon dioxide gas – CO2 – can be produced by inorganic processes, or by the metabolisms of living things. Before Earth had life on it, carbon dioxide gas likely came from volcanic activity and asteroid impacts. Today, carbon is also released into the atmosphere through the activities of living things, such as the exhalations of animals, the actions of decomposer organisms, and the burning of wood and fossil fuels by humans. “Producers” – organisms that produce food from sunlight, such as plants – absorb carbon dioxide from the atmosphere and use it to build sugars, lipids, proteins, and other essential building blocks of life. “Consumers” are organisms that eat other living things. Animals are the most visible type of consumer in our ecosystems, though many types of microbes also fall into this category. Consumers incorporate carbon compounds from plants and other food sources when they eat them. They use some of these carbon compounds from food to build their own bodies – but much of the food they eat is broken down to release energy, in a process that is almost the reverse of what producers do. While producers use energy from sunlight to make bonds between carbon atoms – animals break these bonds to release the energy they contain, ultimately turning sugars, lipids, and other carbon compounds into single-carbon units. These are ultimately released into the atmosphere in the form of CO2. But, what about the carbon compounds that don’t get eaten, or broken down by animals? Plants and animals that die without being eaten by other animals are broken down by other organisms, called “decomposers.” Decomposers include many bacteria and some fungi. They usually only break down matter that is already dead, rather than catching and eating a living animal or plant. Just like animals, decomposers break down the chemical bonds in their food molecules. They create many chemical products, including in some cases CO2. Recently, humans have made some big changes to the Earth’s carbon cycle. By burning huge amounts of fossil fuels and cutting down roughly half of the Earth’s forests, humans have decreased the Earth’s ability to take carbon out of the atmosphere, while releasing large amounts of carbon into the atmosphere that had been stored in solid form as plant matter and fossil fuels. This means more carbon dioxide in Earth’s atmosphere – which is particularly dangerous since carbon dioxide is a “greenhouse gas” that plays a role in regulating the Earth’s temperature and weather patterns. The scientific community has raised alarms that by making significant changes to the Earth’s carbon cycle, we may end up changing our climate or other important aspects of the ecosystem we rely upon to survive. As a result, many scientists advocate decreasing the amount of carbon burned by humans by reducing car use and electricity consumption, and advocate for investing in non-burning sources of energy such as solar power and wind power. The carbon cycle consists of many parallel systems which can either absorb or release carbon. Together, these systems work to keep Earth’s carbon cycle – and subsequently its climate and biosphere – relatively stable. Below are some examples of parts of Earth’s ecosystems that can absorb carbon, turn carbon into living matter, or release carbon back into the atmosphere. One major repository of carbon is the carbon dioxide in the Earth’s atmosphere. Carbon forms a stable, gaseous molecule in combination with two atoms of oxygen. In nature, this gas is released by volcanic activity, and by the respiration of animals who affix carbon molecules from the food they eat to molecules of oxygen before exhaling it. Carbon dioxide can be removed from the atmosphere by plants, which take the atmospheric carbon and turn it into sugars, proteins, lipids, and other essential molecules for life. It can also be removed from the atmosphere by absorption into the ocean, whose water molecules can bond with carbon dioxide to form carbonic acid. The Earth’s crust – called the “lithosphere” from the Greek word “litho” for “stone” and “sphere” for globe – can also release carbon dioxide into Earth’s atmosphere. This gas can be created by chemical reactions in the Earth’s crust and mantel. Volcanic activity can result in natural releases of carbon dioxide. Some scientists believe that widespread volcanic activity may be to blame for the warming of the Earth that caused the Permian extinction. While the Earth’s crust can add carbon to the atmosphere, it can also remove it. Movements of the Earth’s crust can bury carbon-containing chemicals such as dead plants and animals deep underground, where their carbon cannot escape back into the atmosphere. Over millions of years, these underground reservoirs of organic matter liquefy and become coal, oil, and gasoline. In recent years, humans have begun releasing much of this sequestered carbon back into the atmosphere by burning these materials to power cars, power plants, and other human equipment. Among living things, some remove carbon from the atmosphere, while others release it back. The most noticeable participants in this system are plants and animals. In a gracefully balanced set of chemical reactions, animals eat plants (and other animals), and take these synthesized molecules apart again. Animals get their fuel from the chemical energy plants have stored in the bonds between carbon atoms and other atoms during photosynthesis. In order to do that, animal cells dissemble complex molecules such as sugars, fats, and proteins all the way down to single-carbon units – molecules of carbon dioxide, which are produced by reacting carbon-containing food molecules with oxygen from the air. The Earth’s oceans have the ability to both absorb and release carbon dioxide. When carbon dioxide from the atmosphere comes into contact with ocean water, it can react with the water molecules to form carbonic acid – a dissolved liquid form of carbon. When there is more carbonic acid in the ocean compared to carbon dioxide in the atmosphere, some carbonic acid may be released into the atmosphere as carbon dioxide. On the other hand, when there is more carbon dioxide in the atmosphere, more carbon dioxide will be converted to carbonic acid, and ocean acidity levels will rise. Some scientists have raised concerns that acidity is rising in some parts of the ocean, possibly as a result of increased carbon dioxide in the atmosphere due to human activity. Although these changes in ocean acidity may sound small by human standards, many types of sea life depend on chemical reactions that need a highly specific acidity level to survive. In fact, ocean acidification is currently killing many coral reef communities. 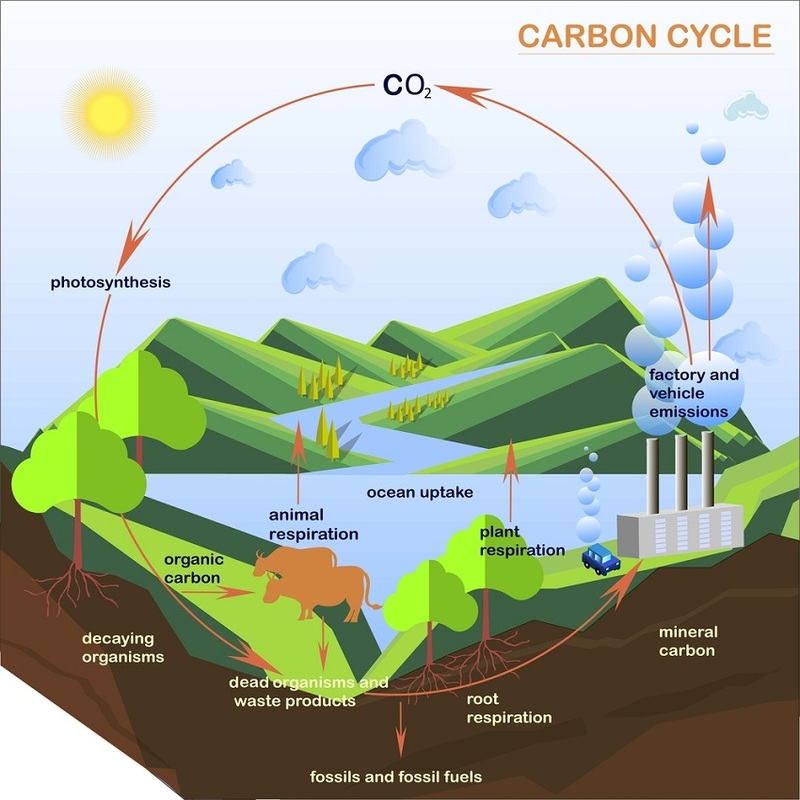 Why is the Carbon Cycle Important? The carbon cycle, under normal circumstances, works to ensure the stability of variables such as the Earth’s atmosphere, the acidity of the ocean, and the availability of carbon for use by living things. Each of its components is of crucial importance to the health of all living things – especially humans, who rely on many food crops and animals to feed our large population. Carbon dioxide in the atmosphere prevents the sun’s heat from escaping into space, very much like the glass walls of a greenhouse. This isn’t always a bad thing – some carbon dioxide in the atmosphere is good for keeping the Earth warm and its temperature stable. But Earth has experienced catastrophic warming cycles in the past, such as the Permian extinction, which is thought to have been caused by a drastic increase in the atmosphere’s level of greenhouse gases. No one is sure what caused the change that brought about the Permian extinction. But, greenhouse gases may have been added to an atmosphere by an asteroid impact, volcanic activity, or even massive forest fires. Whatever the cause, during this warming episode temperatures rose drastically. Much of the Earth became desert, and over 90% of all species living at that time went extinct. This is a good example of what can happen if our planet’s essential cycles experience a big change. 1. Which of the following is NOT a vital component of the carbon cycle? A. Photosynthesizers take carbon from the atmosphere and turn it into sugars, proteins, lipids, and other vital materials for life. B. Oxygen-breathers break down organic materials into energy and carbon dioxide, which they release back into the atmosphere. C. The ocean absorbs carbon in the form of carbonic acid or calcium carbonate. D. Geologic activity releases carbon in the form of volcanic gases. 2. Which of the following is NOT true of carbon levels in Earth's atmosphere? A. The composition of Earth's atmosphere has changed drastically over time. B. Drastic changes to the temperature of Earth's surface have happened as a result of changes in the atmosphere's carbon levels. C. Mass extinctions have occurred as a result of changes to the atmosphere's carbon levels. D. It is impossible to significantly change the carbon levels in Earth's atmosphere. 3. Which of the following would NOT be a possible outcome if the carbon cycle were severely disrupted? A. Severe global cooling as a result of fewer greenhouse gases in the Earth's atmosphere. B. Severe global warming as a result of more greenhouse gases in the Earth's atmosphere. C. Drastic changes to ocean ecosystems due to changing ocean acidity. D. Drastic changes to land ecosystems as a result of changing temperatures and weather patterns. 4. The internal combustion engine has created much of the increase in greenhouse gases we are seeing today. However, where else can the carbon from engines end up? 5. Why would climate change caused by carbon emissions lead to mass extinction? B. Large changes in climate will make the planet icy or too hot, killing many species. C. Even small changes in the climate can change the amount of precipitation and nutrients certain areas receive. Even these small changes can lead to mass extinction. Houghton, J. T. (2001). Climate change 2001: the scientific basis: contribution of Working Group I to the third assessment report of the Intergovernmental Panel on Climate Change. New York: Cambridge University Press. What Do Biogeochemical Cycles Connect?